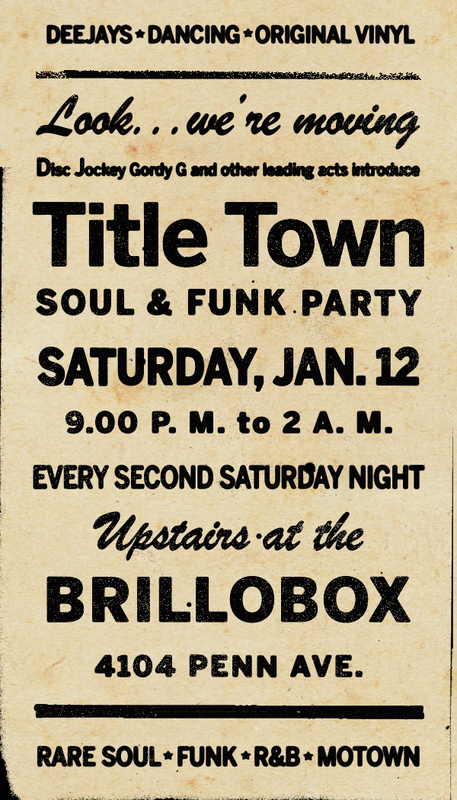 “Something old and something new.”Join us on Saturday, January 12th when the long running TITLE TOWN Soul & Funk Party kicks off 2013 at its new home at the Brillobox.Every second Saturday, TITLE TOWN spins vintage soul records from the best periods of American music – and it’s one of only a few parties of its kind in Pittsburgh. It’s a dance floor journey from the fifties onward, taking in Northern Soul, classic Rhythm & Blues, Motown, Funk, Mod Jazz, and Latin Boogaloo - and it's all got a whole lotta soul. Guest deejays from Pittsburgh and around the globe spin their selections for five hours while the Brillobox bartenders supply the cocktails and a fine assortment of good brews - you just have a good time. With the name inspired by Pittsburgh’s "Title Town, U.S.A." records from the late ‘70s/early ‘80s, TITLE TOWN continues our never-ending mission of providing the good the stuff. We'll take you back to the long gone days of sweaty Chicago juke joints, the Memphis Horns and the Detroit Sound. We'll dig deeper and spin the lost treasures of Toledo and Columbus, New Orleans, Philadelphia and Pittsburgh, Pa. To help get us started on the good foot, we’ve enlisted friend and Pittsburgh soul ambassador, DJ Riel of the Steel City Soul Club. A TITLE TOWN debut for this long-time DJ and collector, DJ Riel is credited with hosting the five year run of the Restless soul night in the South Side and the Revival party at the Firehouse Lounge. When DJ hits the decks, you can expect a feel-good mix of ‘60s & ‘70s rare and Northern Soul, Latin Boogaloo, Ska and everything in between. It’s gonna be a big thing! Early arrival is recommended. Sponsored by Cultures of Soul Records. Cultures of Soul Records is the record label part of the Cultures of Soul brand. Cultures of Soul Records is the label catering to the tastes of DJs all over the world playing unique, rare, and unreleased styles of funk, soul, jazz, disco, latin, brazilian, and afro beat for their dancefloors.